BACKGROUND AND PURPOSE: Morphologic changes in the dural sinuses and emissary veins of the posterior fossa relate closely to the development of the brain. We report characteristic findings of imaging in six patients with a rare and forgotten emissary vein called the petrosquamosal sinus (PSS). METHODS: From a larger group of patients with ear abnormalities, we selected six patients from three ENT imaging centers, because they had CT features suggestive of a PPS. This was the criterion for inclusion in this retrospective study. They were explored by high-resolution CT (HRCT) of the temporal bone. MR venography was performed in three patients to determine the presence and patency of the emissary vein. RESULTS: The PPS was bilateral in two patients and unilateral in the other four. It affected mainly the left side (left:right ratio, 5:3). Three patients had associated inner ear (n = 2) or middle ear malformations (n = 1). Five of six patients had jugular vein hypoplasia, with development of emissary mastoid veins in three patients. CONCLUSION: Petrosquamosal sinus can be identified on HRCT in a typical location. It is encountered more frequently in patients referred for congenital abnormalities of the skull base. This rare anatomic variant should be assessed before surgical treatment, because proper identification of these large venous channels would be of interest to the surgeon. Emissary veins participate in the extracranial venous drainage of the dural sinuses of the posterior fossa, in addition to the internal jugular vein, or instead of this vein if it is aplastic or thrombosed. Among the known transmastoid emissary vein outlets, drainage through the petrosquamosal sinus (PSS) has been reported rarely in humans (1) and only by anthropologists and anatomists. 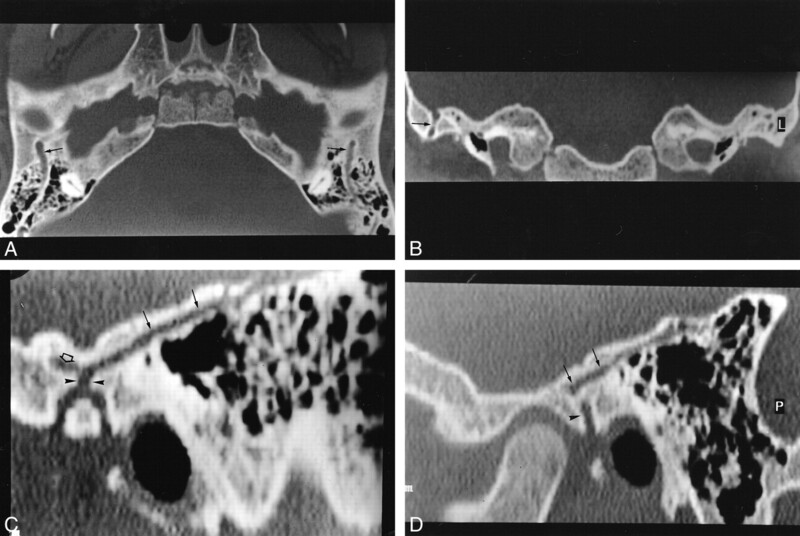 The purposes of the present paper are to show the appearance of the PPS on CT scans of the temporal bone, to discuss its origin, and to consider its potential role in the spread of infections of the external auditory canal and in complications of middle ear surgery, such as bleeding or thrombophlebitis. The PSS is an emissary vein connecting the intra- and extracranial venous networks and is present in some variants of venous cerebral drainage, including the squamosal type of the middle meningeal cerebral vein. It arises from the dorsolateral portion of the transverse sinus, before the confluence of the transverse sinus with the superior petrosal sinus. It courses over the lateral superior surface of the petrous bone. It has two drainage pathways: one anteroinferiorly into the retromandibular vein via the foramen retroarticulare and one anteromedially into the pterygoid venous plexus via the foramen ovale. The PSS collects the middle and superficial temporal veins, the masseterine veins, and the internal maxillary veins and drains into the external jugular vein (Fig 1). It usually disappears during the development of adult venous patterns in the last 3 months of prenatal life. A, Posterior coronal section of the temporal bone. Petrosquamosal suture between the squama (laterally) (2) and the petrous bone (medially) (3). PPS (1) is illustrated in the upper portion of the petrosquamosal suture. Residual arterial and venous vascular tracts (4) probably are the cause of bleeding during transmastoid or translabyrinthine procedures. B, Axial view showing the origin of the PSS and its relation with the middle meningeal venous network (from Padget). 1, transverse sinus; 2, sigmoid sinus; 3, inferior petrosal sinus; 4, superior petrosal sinus; 5, petrosquamosal sinus; 6, middle meningeal sinus draining into the cavernous sinus and the pterygoid venous plexus via the foramen ovale (small arrow); 7, retromandibular vein draining into the external jugular vein; 8, sinus communicans. A 34-year-old Caucasian woman presented with left-sided otalgia and vertigo. The audiogram showed bilateral sensorineural hearing loss (SNHL). Temporal bone high-resolution CT (HRCT) showed hypoplasia of the left lateral sinus. We noted a groove, 3 mm in diameter, that extended laterally on the superior portion of the petrous bone. It led into a supra- and retroglenoid foramen (Fig 2). The left jugular foramen was normally developed. On the right temporal bone, a similar sulcus of smaller diameter was identified, draining into a thin retroglenoid foramen. We noted no other abnormalities of the skull base. No surgery was performed. A 6-year-old Caucasian girl presented with bilateral SNHL and signs characteristic of a CHARGE (Coloboma, Heart defect, choanal Atresia, Retardation, and Genital and Ear anomalies) association. HRCT showed bilateral, severe hypoplasia of the semicircular canals and the vestibule. The lateral sinus was present but the left jugular foramen was hypoplastic. On the left side, the tympanic portion of the facial nerve was dehiscent, crossing over the oval window. A venous groove was depicted laterally on the superior surface of the petrous bone, extending into the posterosuperior portion of the temporomandibular joint (TMJ). We noted a transmastoid venous canal joining the facial nerve and the internal jugular vein. A 25-year-old Caucasian woman was referred for bilateral SNHL. HRCT showed bilateral inner ear abnormalities consisting of severe hypoplasia of the semicircular canals, aplasia of the oval fossa, and a dehiscent tympanic portion of the facial nerve. On the right side, HRCT showed hypoplasia of the middle ear, malformation of the ossicles, and aplasia of the jugular foramen. The mastoid and posterior condylar canals were enlarged. We noted a bony canal in the superior petrous bone leading to the posterior part of the TMJ (Fig 3A–C). MR venography showed an unusual drainage pathway of the transverse sinus, which drained anteriorly into the PSS, the retrocondylar vein, and the external jugular vein, and posteriorly into a transmastoid vein and an occipital vein. The sigmoid sinus was absent. Moreover, a craniocervical junction abnormality was shown. 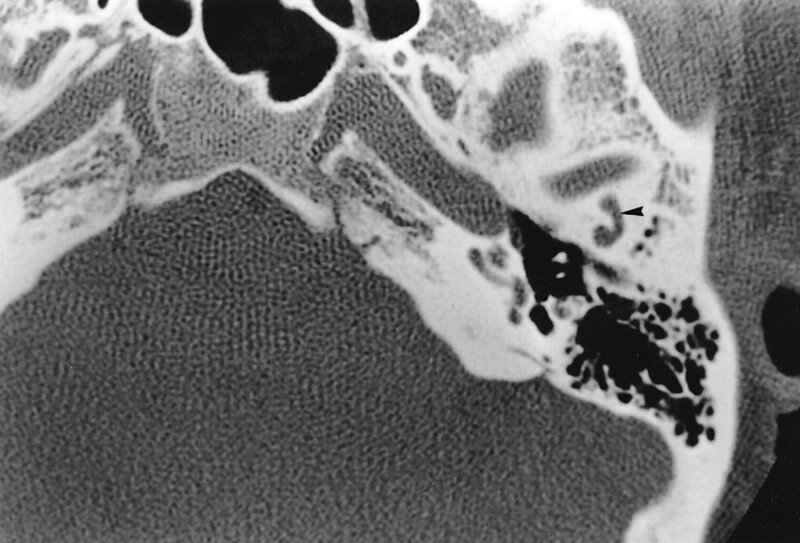 A, Axial HRCT section passing through the attici shows a sulcus (arrows) about 2 mm thick, originating from the anterior portion of the transverse sinus and passing anteriorly through the lateral portion of the petrous bone. Also shown are middle ear hypoplasia and posterior semicircular canal aplasia. B, Axial CT section 5 mm below A shows the PSS entering into a retroarticulare foramen. Note the dehiscence of the genu of the facial nerve (white arrowhead). C, HRCT 10 mm below B shows aplasia of the jugular foramen. Posterior condylar and mastoid canals (arrow) are illustrated. A 47-year-old Caucasian man was referred for exploration of a left-sided, progressive, conductive hearing loss. Previous surgical exploration of the left middle ear had shown a bulge in the left facial nerve that was reddish-blue, bled easily, and caused compression of the stapes and incus. An ossicular ankylosis also was present. No surgical repair was possible for this rare cause of ossicular blockage. 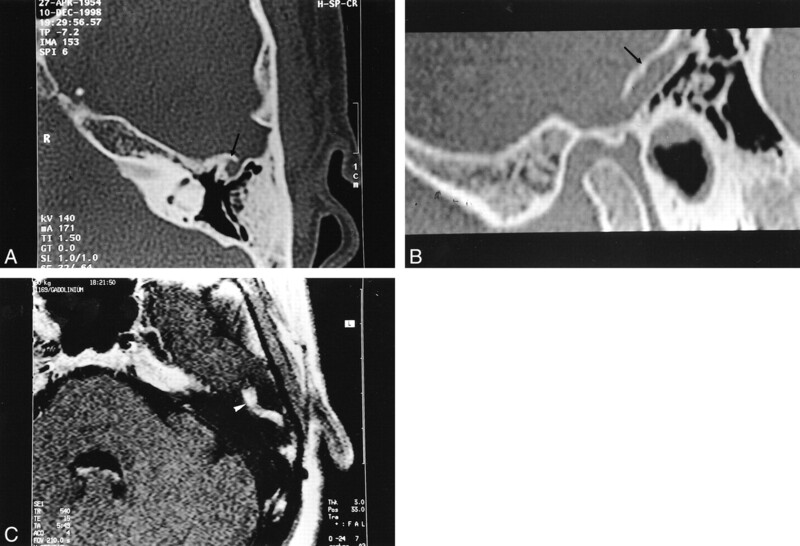 Postsurgical CT and MR examinations showed bilateral middle ear malformations (Fig 4). MR venography showed bilateral absence of the internal jugular veins and the sigmoid sinuses with development of large emissary outlets through the facial canal, the mastoid, and the inferior and superior petrosal sinuses (Fig 4B). The cerebral venous drainage through the left pterygoid plexus was excessively developed. CT of the right temporal bone showed ossicular malformations and similar but less important venous anomalies. Moreover, MR imaging showed hydrocephalus, absence of corpus callosum, and “kissing ” internal carotid arteries. A, Axial HRCT shows anterior (double arrows) and posterior (large arrow) PSS sulcus of the temporal bone. The mastoid portion of the facial canal is enlarged (arrowheads). A 15-year-old Caucasian girl was referred for conductive hearing loss. She also suffered from malnutrition and rickets due to celiac disease. HRCT showed a bilateral, 2-mm groove extending through the laterosuperior portion of the petrous bone. On the right side, the canal ended at the superior border of the TMJ and formed an anterior squamous collateral pathway (Fig 5). Right jugular vein hypoplasia was depicted. A, Axial HRCT section shows bilateral PSS sulci (arrows) located on the upper portion of the petrous bone, coursing posteriorly from the union of the transverse and sigmoid sinuses to the superior portion of the TMJ. B, Coronal CT section shows a vertical transquamous pathway of the right PSS (arrow). C and D, Sagittal reformatted CT sections show the pathway of the PSS ending in the supraglenoid foramen (arrowheads) on the left side (C) and the foramen retroarticulare (arrowhead) on the right side. There is a left anterior collateral pathway (open arrow), suggestive of a sinus communicans. 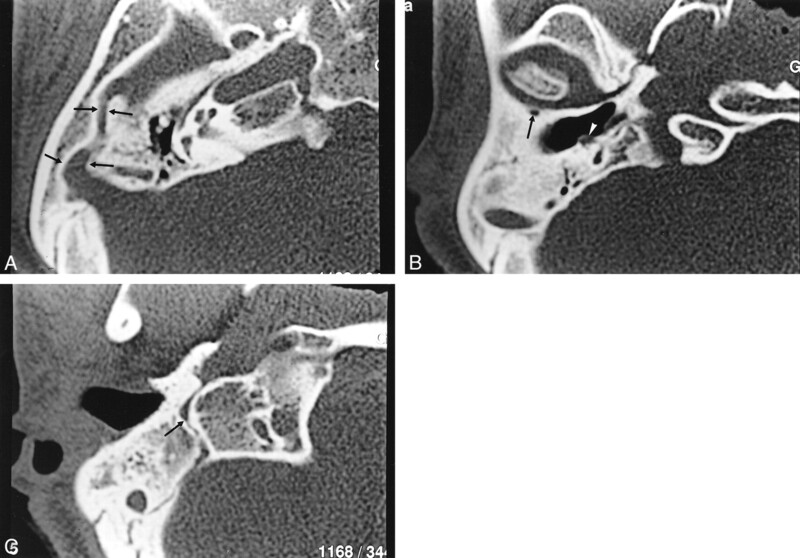 A 40-year-old Asian woman was referred for chronic otitis. HRCT showed normal aeration of the middle ear bilaterally. On the left, we noted a large, temporal bone canal at the lateral part of the superior surface of the petrous bone. It originated on the upper part of the sigmoid sinus and ended near the posterior part of the TMJ (Fig 6). MR imaging and venography showed a patent vein inside this canal, hypointense on T1-weighted images that enhanced homogeneously after contrast medium injection. MR venography showed a structure with a signal intensity equal to that of the transverse sinus, communicating with the external jugular vein. The left sigmoid sinus was hypoplastic relative to that on the right side. The left jugular foramen was present. We saw no abnormalities of the skull base. A, Upper axial HRCT section passing through the attici shows an anterior, well-defined hole (arrow) located in the petrosquamosal suture (arrow). B, Sagittal reformatted section shows the pathway of the petrosquamosal sinus(arrow) located on the upper portion of the temporal bone. C, Postcontrast, T1-weighted image shows a tubular enhancement (white arrowhead) of the petrosquamosal sinus with signal intensity similar to that of other venous structures. Analysis of these six patients raised several questions and initiated our review of the literature on the so-called emissary veins of the temporal bone (Table). The development of cerebral venous drainage pathways has been well depicted in human anatomic studies. The pathway of the petrosquamosal sinus (PSS), however, has not been mentioned in the radiologic literature. We wished to clarify the pathways of transtemporal venous drainage and to illustrate the possible complications related to this venous variant. The internal jugular vein is the main pathway for cerebral venous drainage and is formed by the inion of the lateral sinus with the inferior petrous vein. The transverse and the sigmoid sinuses form the lateral sinus. The transverse sinus begins at the inion, runs laterally with a slight upward convexity to the base of the mastoid process, and then continues as the sigmoid sinus. These sinuses are poorly developed at the 80-mm stage of fetal life and maintain their tiny caliber until 2 years after birth. 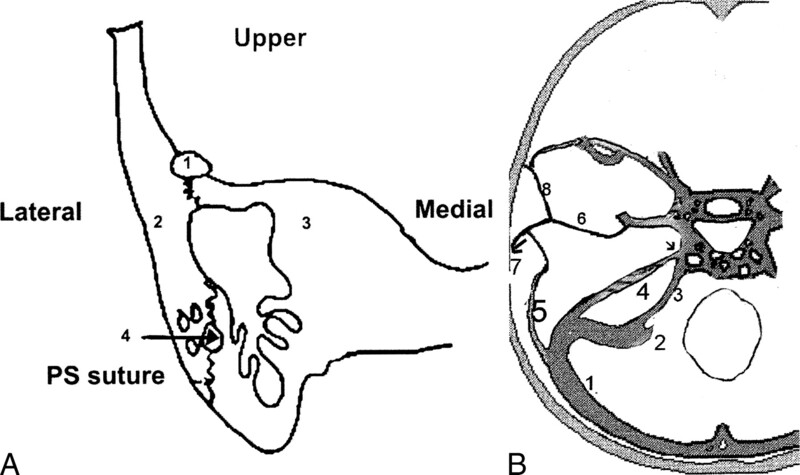 Alterations in the course of the sigmoid sinus appear to occur between weeks 30 and 40 of fetal life and are influenced by the development of the cerebellum (1). Development of the intracerebral veins and their extracranial drainage is complex in humans (2). The primary capillary plexus of the early embryo develops in three layers. The superficial vessels drain into the external jugular vein; the middle and deep vessels, into the internal jugular vein. Emissary veins (in the last 3 months of fetal life) consist of residual connections between the superficial and middle layers. Some have postulated that persistence of vestigial veins coexists with a certain type of fetal circulation (1). Their presence may result from selection for bipedalism by epigenetic adaptations of the venous routes to drain cerebral blood. Emissary veins originate from the sigmoid sinus, communicate with extracranial veins, and develop more frequently on the left side (18% over 5%) (1). They usually are <1 mm in diameter, but they can be as large as 4 mm (3) (Fig 2). The sigmoid sinus may be smaller in the presence of large emissary veins. Boyd (3) postulated that the horizontal and sigmoid portions of the lateral sinus form at different times; if the sigmoid portion fails to develop, the horizontal portion would exit the skull through enlarged emissary veins. The lower or posterior condylar vein (4), which exits the sigmoid sinus above the jugular bulb, and usually is of moderate size. The middle or mastoid emissary vein, the most constant of which crosses the mastoid foramen and unites the sigmoid sinus with the posterior auricular or occipital vein (5, 6). Its development is in balance with regression of the posterior condylar canal (7). The upper petrosquamosal emissary vein, originating at the junction of the transverse and sigmoid sinus. It usually is very small. These emissary veins play a small role in healthy people. They may act as a safety valve, providing an exit for cerebellar blood flow or preventing dangerous increases in intracranial pressure in patients with lesions of the neck or skull base and bilaterally obstructed internal jugular veins (4, 5, 7). Emissary vein canals can become enlarged in the event of high-flow vascular malformations or in severe hypoplasia or aplasia of the jugular veins, which may occur in malformations of the skull base such as craniosynostosis (8). Therefore, transosseous vessels draining into the external jugular vein and the vertebral venous plexus may ensure most of the venous drainage and may represent a contraindication for vault expansion surgery. They can be so well developed that they can give a loud “venous” pulsatile bruit and a thrill (4). A patent mastoid emissary vein may be the origin of bleeding during surgery of the skull base or middle ear. This usually is controlled by bone wax, but it also presents an increased risk for migration of the bone wax into the lateral sinus, in the presence of abnormally dilated emissary veins (9). Emissary veins can be the source of thrombosis in the sigmoid sinus occurring after middle ear surgery or of a retrograde, thrombophlebitic extension from an infected mastoid cavity (10–12). The spread of sepsis has been reported in relation with emissary veins (13). The PSS connecting intra- and extracranial venous drainage is considered an emissary vein (14). Until now, its pathway has been described in animals having a predominantly quadripedal gait. Present in primates such as the baboon, the PSS is dorsolateral to the transverse sinus, arising midway between the confluence of the transverse sinus with the superior petrosal sinus, and coursing over the extreme lateral part of the petrous bone. It has two drainage pathways into the basilar and cavernous sinuses: one anteroinferiorly into the retromandibular vein via the foramen retroarticulare and one anteromedially into the pterygoid venous plexus via the foramen ovale. The PSS collects the middle and superficial temporal veins, the masseterine veins, and the internal maxillary veins and drains into the external jugular vein (15, 16). The study of meningeal networks helps explain the evolution of the cerebral venous drainage in primate species. In species with a quadripedal gait, eg, the lemur, the PPS participates in the drainage for the entire brain (16). It drains into the retromandibular vein and unites the anterior and posterior meningeal networks by connections with the ophthalmic vein. In more developed primates, the PSS connects with both the pterygoid plexus (foramen ovale) and the retromandibular vein (foramen retroarticulare). In primates with a bipedal gait, the foramen retroarticulare disappears but the PSS still connects the lateral sinus with the pterygoid plexus. In primitive primate species, therefore, the PSS ensures cranial venous drainage anteriorly into the external jugular vein by the foramen retroarticulare. With the evolution of primates, the foramen retroarticulare regressed as the pterygoid plexus increased its functional value (16). In humans, the PSS, while present during embryologic development, usually has disappeared by the time of birth. It recently has been reported that a PSS occasionally might persist in humans, without anterior or posterior communications (2, 17). At the beginning of this century, however, Le Double described its course and frequency in a series of human cadaver dissections (17). In contrast with recent reports, he found a PSS present in about 30% of the 26 cadavers, either bilaterally (n = 7) or unilaterally (n = 19), and more frequently on the left side (18). The higher frequency of emissary veins on the left may be associated with the smaller diameter of the left internal jugular vein. The diameter of the PSS is usually as small as that of a silk thread. It occasionally may be as large as 2 to 4 mm, as shown by our series. It originates at the junction between the transverse and sigmoid sinuses, coursing laterally above the superior border of the temporal bone, located on the lateral part of the petrous bone, at the upper portion of the petrosquamosal suture. The petrosquamosal suture, barely distinguishable in the adult skull, is located at the union of the petrous and squamous bones (6) (Fig 6). The anterolateral portion (squama) arises from mesenchyme at 8 weeks of fetal life; the petromastoid portion develops later from a cartilaginous center, at about 5 to 6 months of fetal life (5). One report has described a residual vascular tract in the midportion of the petrosquamosal suture, left from an ascending branch of the occipital artery (6). Therefore, a persistent PSS may indicate when embryologic development was arrested; some authors have hypothesized a possible role of the homeobox gene (19). The PSS ends according to reported frequencies (17), via the foramen retroarticulare, located between the osseous portion of the external auditory canal and the squama (Fig 4D–E); the supraglenoid foramen, between the squama and the zygomatic arch (Fig 4B); or the anterior squamous foramen. The foramen retroarticulare (or postglenoid foramen or Lushka's foramen jugulare spurium) (Figs 1 and 2) is found in about 10% of human cadaver dissections, most often unilaterally. Through this foramen, the blood flowing in the PSS is directed into the retromandibular vein and then into the external jugular vein (18). Occasionally a small, anterior, horizontal venous canal, called the sinus communicans, can be identified. It originates from the foramen retroarticulare and joins the pterygoid venous plexus (15). We encountered this variant twice (Fig 4C) in our series. Analysis of the six reported patients showed that PSS was present more frequently on the left side (n = 3) or predominated on the left side, if bilateral (n = 2), probably related to a higher frequency of a narrow caliber of left internal jugular vein. The PSS seems to be more frequent in women (n = 5) than in men (n = 1) and in patients presenting with severe, congenital inner ear anomalies (n = 2 of 7) or hypoplasia of the internal jugular vein (n = 5). No ethnic factor was established by our series, although some authors have postulated that developmental, temporal vascular grooves occur more frequently in the Asian Indian population (5). We hypothesized that vulnerability of the PSS during middle ear surgery (20–22) or translabyrinthine routes to the posterior fossa may cause uncontrollable surgical bleeding or postoperative thrombosis of the sigmoid sinus. Furthermore, retrograde spread of infection or tumors of the external auditory canal may be promoted by this developmental venous variant. Therefore, its description should be systematically included in temporal bone CT and cerebral MR venography. The petrosquamous sinus is an embryonic venous remnant, which usually regresses during fetal life, that connects the lateral sinus with the retromandibular vein, eg, the internal jugular vein with the external jugular vein. HRCT and MR imaging can assess both the anatomy and function of emissary veins accurately. Reformatted sagittal and coronal HRCT sections may help to show the origin and pathways of this transtemporal venous channel. In the May 2001 issue of the AJNR, the cover incorrectly contained the title “MRS Imaging of Gamma Knife Treatment for Gliomas” that clearly had nothing to do with the illustration of a mycotic aneurysm and fungal sinusitis. It was an unfortunate near-duplication of the title that appeared on the cover of the April 2001 issue. The authors acknowledge P. Lasjaunias (Bicêtre) and R. Saban (Museum Orfila-Paris Medical School) for their accurate scientific support and exquisite explanation of the anatomy of venous brain drainage in humans and animals, W.O. Grauer (Zurich, Bethanien Spital) for reviewing this paper, Edith Tranchon for her technical assistance, and Daniel Rochet for iconography. 1 Presented at the 33rd Annual Meeting of the American Society of Head and Neck Radiology, San Diego, California, May 1999. 2 Address reprint requests to K. Marsot-Dupuch, Service de NeuroRadiologie, Pr. P Lasjaunias, Hôpital Bicêtre, 78 Rue du Génèral Leclerc, 94275 Le Kremlin-Bicêtre, France. Accepted after revision February 14, 2001. Absent Semicircular Canals in CHARGE Syndrome: Radiologic Spectrum of Findings.